Patriots win dogfight against Bulldogs 25-22, 25-19, 25-23. "This is the lesson: never give in, never give in, never, never, never, never—in nothing, great or small, large or petty—never give in except to convictions of honour and good sense. Never yield to force; never yield to the apparently overwhelming might of the enemy." — Winston Churchill @ Harrow School, 29 October 1941. Winston Churchill knew how to speak and to lead during trying times, mobilizing the British people toward "their finest hour" in an unrelenting battle against their WWII enemy. Spend some time reading about Churchill on www.winstonchurchill.org . The man would have made a great volleyball coach, even if he knew nothing about the game. Check it out. There is no doubt that the coaches of Churchill's boys volleyball team are great volleyball coaches. That alone was enough for Wootton to respect the force that the Bulldogs would bring to Wootton's home court on Monday night. It was a battle where neither team gave in. Thomas Sprigg Wootton, on the other hand, was a Patriot whose convictions on defending the best interests of his homeland were part of the growing solidarity that led to American independence from the British Empire. 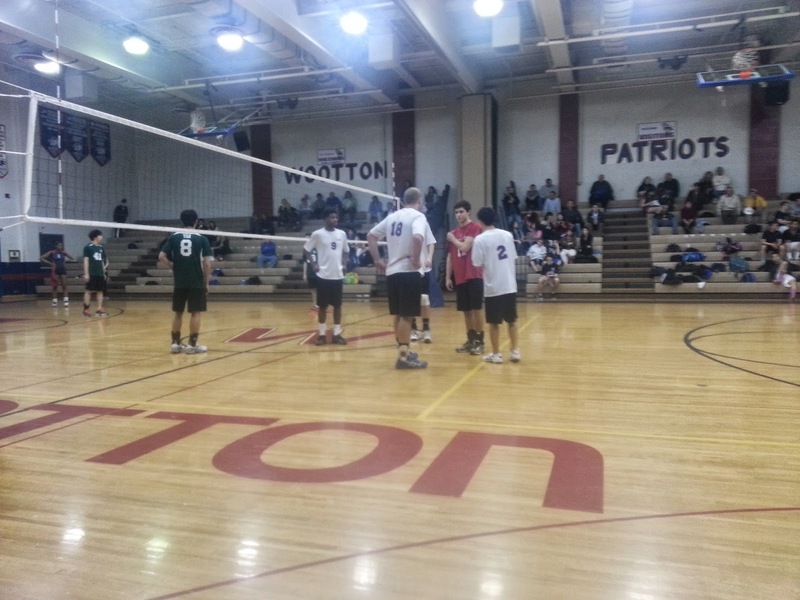 Right on cue with their historical namesake, Wootton's volleyball Patriots defended their home court, led by seniors Paul Malinauskas, Benjamin Wang and Cary Chin. Senior David Li was instrumental in keeping the team's wits above the curve...OK, he kept the coach from chewing his nails off. Juniors Robert Severynse, Adam Kaplan, Mark Pang, Andrew Merchant and Ethan Frymark provided steady support for the cause. Freshmen Omar Nunez and Victor de Avila joined forces with their older teammates to hold off the Bulldogs. Of note, Junior setter/hitter Jeremy Chung took control of the Patriot offense in the third set to complete the victory. Sophomores Justin Wu, Henry Shu, Nathan Xie and Jimmy Ho compete every day in practice against their experienced teammates, and they are unyielding. Preparation, perhaps, is the best way to show respect. Wootton travels to Blair High School on Wednesday, April 9, 2014 to take on the Blazers. The boys match follows the 5:15 pm coed match.